Choosing paint colors can be challenging if not frustrating especially with the growing number of colors to choose from. So I thought I would investigate how to choose a paint color using the different painting tools available ... so far, not a lot of luck. But it has certainly made me think more about finding some kind of cool color visualizer that can make the whole process easier... before I go mad! My Colortopia have a couple of different painting tools on their site to help with choosing paint color. They looked very promising so I thought I would give them a try. The first painting tool is called the Color Tool - found at the top of the page. It's easy enough. You upload a photo of the colours you want to match. 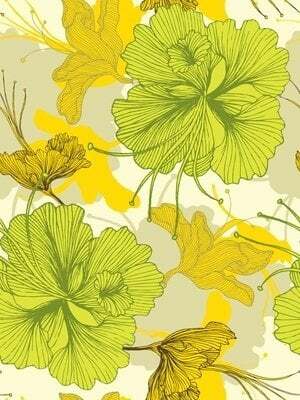 The first photo I selected is of the vintage fabric piece above. Once you have uploaded it, you select a portion of the photo by dragging the cursor and then you are given two colours to select from. You select one and are quickly given three colours to help you with your paint selections. 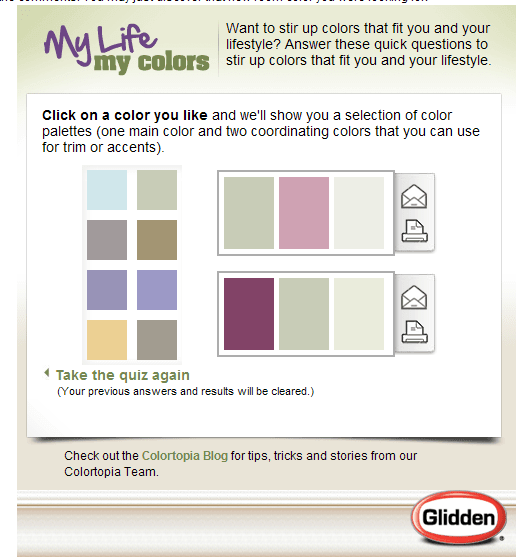 You get a choice of emailing or printing off the paint color list with product details from Glidden.com. My problem - I didn't really like the paint color list they selected for me - so I thought I would try another one.. for luck.. This time the color visualizer painting tool threw up a selection that I consider a better paint color selection. Again I was given two paint colors to choose from, in fact, this time I was given six colours to choose from and then a range of three colours within each of these palette. I found this paint color selection more helpful for selecting wall colors. So I guess, you have to play with color visualizer, using photos with fewer colors. The second painting tool for choosing paint colors also on My Colortopia is the My Life My Colors Quiz - this is not so much a color visualizer but helps with choosing paint colors from a different perspective. It asks a series of questions about you, what you like, how outgoing you are and how your friends would describe you. Lucky for me they given you a second chance to do the quiz again because this is what the test threw out.... not exactly my idea of a cool color scheme. But I like the idea that the wall colors they throw up are a reflection of your personality.Maybe they can fine tune it. The next tool I found is the tool at Sherwin-Williams. I found the Colour Palette Visualizer a little messy to work with because you have to register, give up a few details, confirm your registration and then go back to where you started. It lost all my photo upload details and then froze. No joy first time around. But the second time around I got a little excited because it worked.. and here are the results. After uploading a photo, you select areas you would like to play with. I only selected one - (Note to self: it's best to select more than one because it gives you a lot more options to get creative. ) But I like the wall colors - and it makes choosing paint colors quick and easy. I'd like to see this tool extend to wall stencil ideas - you could some very cool color combinations. 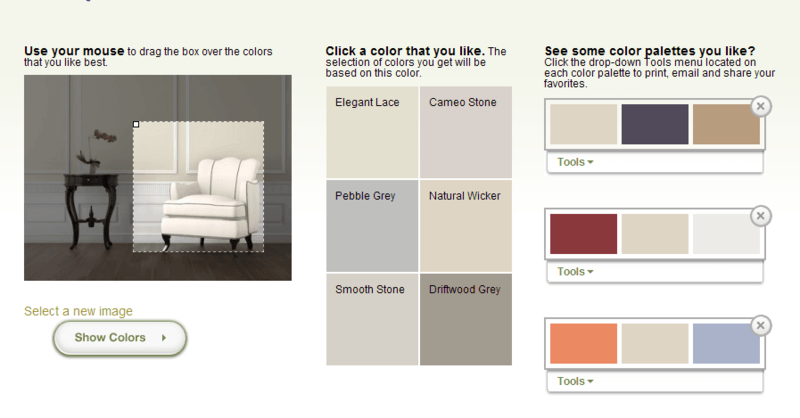 I think I will use the Sherwin-Williams Colour Visualizer again.. but the hunt for amazing painting tools goes on. The difference between the tools that I can gather is the Sherwin Williams tool is good for physical spaces, like the one above, where as the My Colortopia is best used for inspiration. What they don't help you with are the challenges you face with smaller spaces, different fabric textures you can use, or different paint decorating techniques. 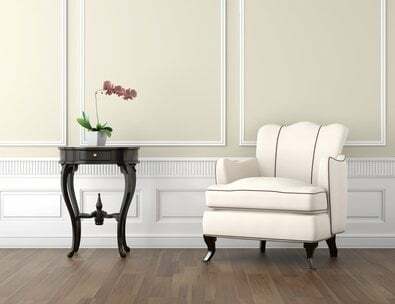 You can find more about simple decorating techniques in an article on Best Wall Colors + Simple Decorating Techniques To Rock Your Rooms. I will continue my hunt for cool color painting tools for choosing paint colors and will report my painting color findings from time to time...c might even put together a list. 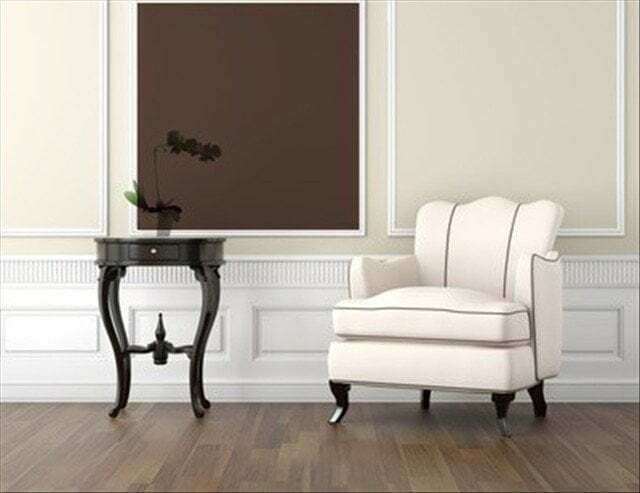 If you know of a really cool color visualizer for choosing wall colors, please leave a comment. Remember to Like Decorated Life on Face Book and Tweet! Hope you're living a Decorated Life... go on, get out there!